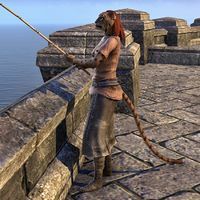 Huddima is a Khajiit fisher who fishes from a wall on the southeast beach of Vulkhel Guard. "This one found a cove along the coast. Rich with clams! Delicious." "The sea calls to this one. Feel the call of Jone and Jode." "Sometimes this one likes to sit and watch the surf wash against the beach. So peaceful." "Yes, this one likes fish. Why is that so funny?" This page was last modified on 9 April 2017, at 18:45.